I recently had the sudden urge to try to learn to spin again. I bought a spindle and some fibre (about 200g of Bluefaced Leicester) a few years ago, but I couldn’t quite get the hand of it, so they have been languishing in my yarn storage box. This time though, something seems to have clicked. I’m hoping to be able to spin yarn to make shawls, scarves socks in sock weight and heavy lace weight. 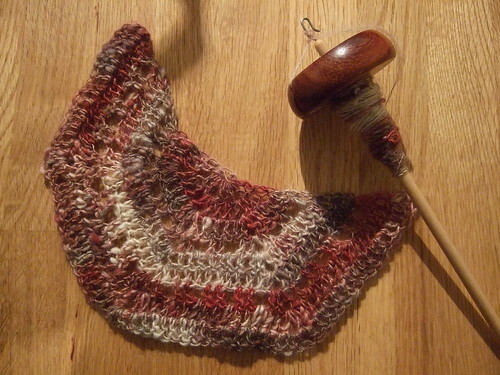 My first attempt was too thick – when plied it came out approx DK weight. I’ve been practising for about one hour every evening over the past week, and last night I finally managed to create a 3 ply sock weight yarn. This is a sample showing my most recent attempts. The first (bottom) yarn is two ply, and came out too fine for socks (it also wasn’t well balanced hence the visible twist). 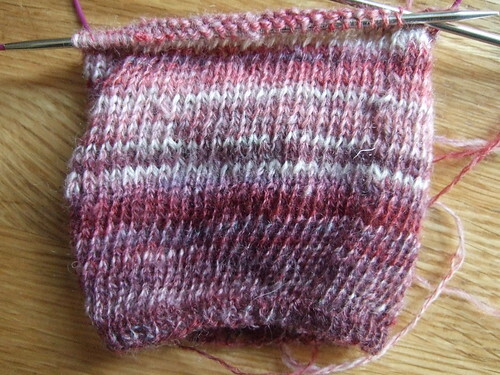 The second (top) yarn was navajo plied. It’s actually for the same roving (some of the Bluefaced Leicester that I hadnpainted with the help of my daughters), but the colours look quite different due to the plying techniques. I’m really enjoying experimenting with my spindle spun, but I’ve got a couple of christmas presents to finish so I’ll have to resist spending too much time with my spindle until they are done! you have got some serious knitting/spinning/focusing skills. i could never come close! I crocheted for years – since I was 7 yrs old and learned to knit back in 1995 – just to learn how to knit socks – and now I spin and started to learn to weave on my RHL (rigid heddle loom) Kromski. Thanks for the shawl pattern. I am off to make a shawl for a dear friend.